When your friends visit from overseas and your gang catches up, there’s no better way to top the night off than with icecream. After drinks at Suke Suke, we wandered up to Bunda Street for icecream, and made it to Via Dolce just before they closed for the night. 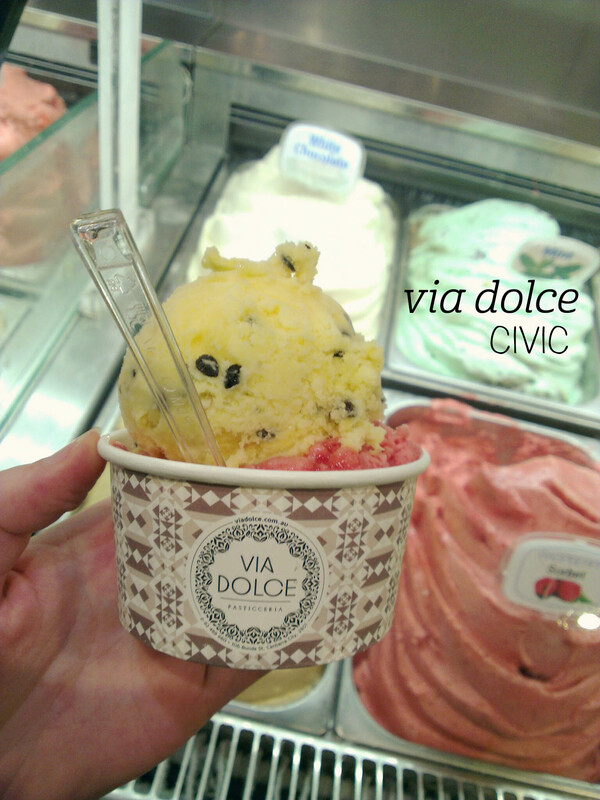 I opted for two scoops, picking (surprise surprise) two fruity sorbets, to celebrate the pleasant spring evening. First was the passionfruit sorbet, which had plenty of seeds scattered throughout and had a nice balance of sweetness-to-tartness. I felt that the texture of this sorbet was a little lacking – it was a bit icy and could have been creamier – but the flavour was solid and basically screamed “PASSIONFRUIT!”. My second pick was pomegranate sorbet, which is a new flavour for me. Having fallen in love with the flavour in Turkey, I absolutely loved its sorbet reincarnation, with a beautiful freshness and just the right amount of sorbet-sweetness. Again, the texture let it down a bit, but on the plus side the serve was massive – 2 scoops were a little pricey at $8, but you certainly get plenty for it. I’m always impressed by the range of sorbets here too – plenty of choice for the lactose intolerant! Whilst I knew exactly where to get icecream in Santiago, it took me a while to realise that there was an heladeria across the road from my hotel in Buenos Aires. But I did realise, and in doing so ended up having one of the best icecreams of my trip. The icecream menu at Chungo is extensive, to the point where I had to ask for the staff’s recommendation to try and whittle the choice down. I finally went for the strawberry and mango (the recommendation) and a pear sorbet, served in a waffle cone. I was delighted to get a choice of toppings, and ended up choosing the candied almonds (why not? I was on holidays). The strawberry and mango sorbet was light and sweet, the mango flavour less prominent than I expected but still noticeable, but the magic flavour was undoubtedly the pear. I can’t describe this any other way – it was like biting into a sweet, ripe pear, except it was icecream. There was nothing artificial, nothing to distract you from the 100% pear-ness of it. I have no idea how they managed to get such an authentic flavour, but it was beautiful and I could have eaten a bucket of it. 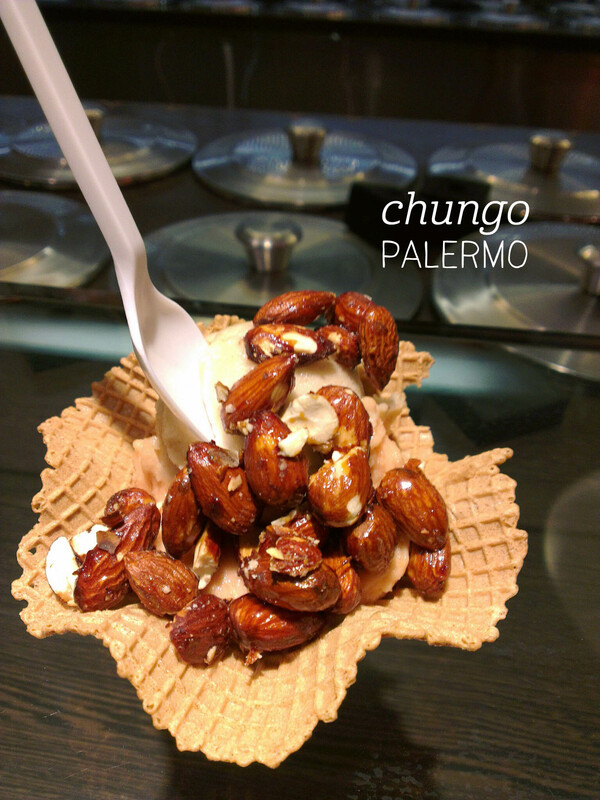 Luckily I was pretty full from the almonds on top, or else I might have… Definitely worth seeking out if you find yourself in BA. I consider myself fairly adventurous when it comes to food, so I made a point of trying to sample the extensive range of unusual icecream flavours in Chile. 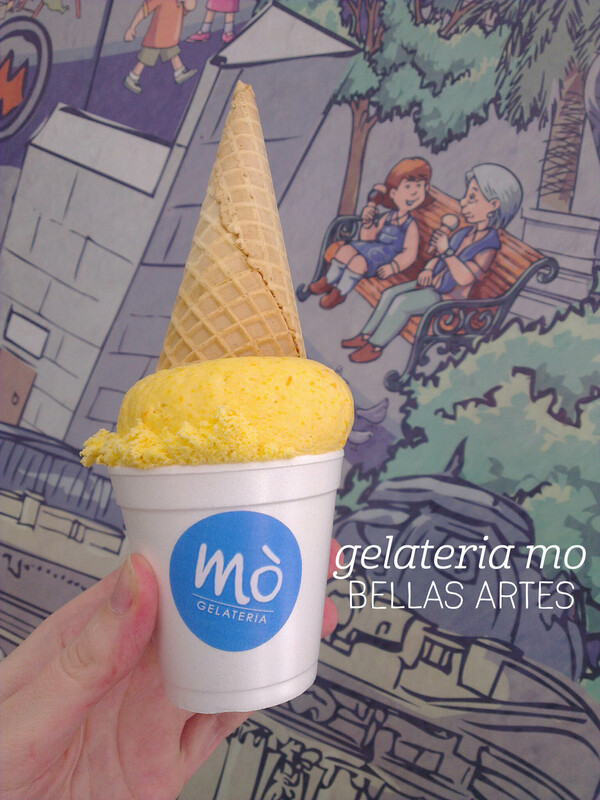 There are a lot, and the first one I came across was in a delightful heladeria in Bellas Artes, right outside the metro station. Have you heard of lucuma? It’s a Peruvian fruit known as ‘the Gold of the Incas’ (or so Google tells me) – its natural sweetness is perfect for anything sweet, including gelato. This gelato was actually Lucuma Meringue flavour, so was sweeter again, but I got my first impression of a new flavour – quite the adventure. It took me a while to realise why this flavour was familiar – I was expecting citrus, which was definitely there, but I also got a hint of something else, which after reading about it afterwards, I realised was maple. The combination with the meringue was sweet and fresh all at once. I was also really impressed by the texture, which was beautifully creamy and not icy at all (I thought it might be a sorbet given the fruit profile, but the website classifies it as a ‘light’ gelato). Highly recommended! I couldn’t only go to Gelateria Primavera once. I mean really, their gelato is that good, I was eager to try more of their exciting flavour range. We stopped by after dinner one night, joining the queue before the theatre crowd arrived for an intermission treat. This time I opted for the plum sorbet, putting it in the category of exotic flavours hard to find anywhere else. 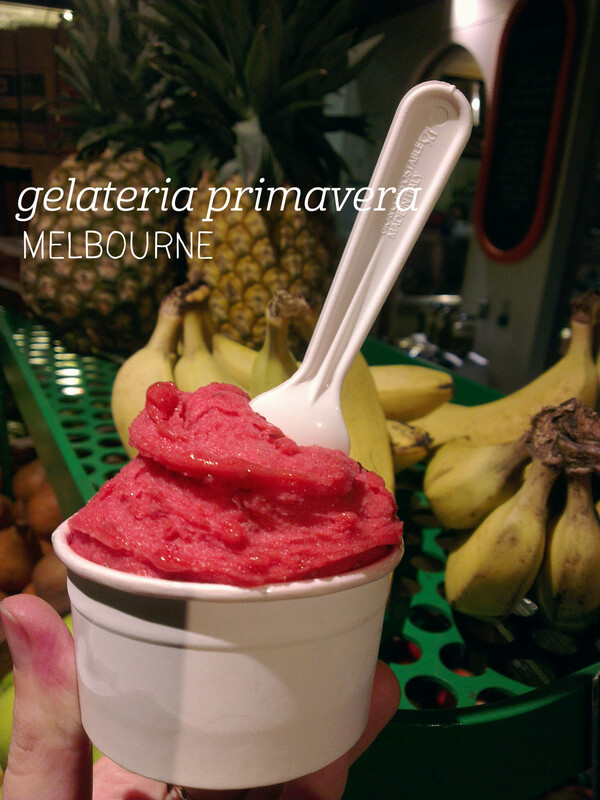 For $5, the scoop is generous and the quality is outrageously good – their sorbets are just so creamy! The plum sorbet has a beautiful, saliva-inducing tartness that is rounded out nicely by the natural sweetness of a sorbet. This flavour is enhance by the tiny flecks of plum skin throughout – for me, this is the mark of a good flavour, showing it has been derived from authentic, rather than artificial, sources. The intensity of this flavour was impressive, not fading at all throughout the portion. Whilst there aren’t a lot of seats, we enjoyed pulling up a stool inside Spring Street Grocer to enjoy our dessert. I wish I lived in Melbourne, to be able to treat myself to a take-home pack. Yum, yum, yum. Gelato perfection found. Hello #icecreamthurs! Let’s eat icecream to pretend it’s still summer. 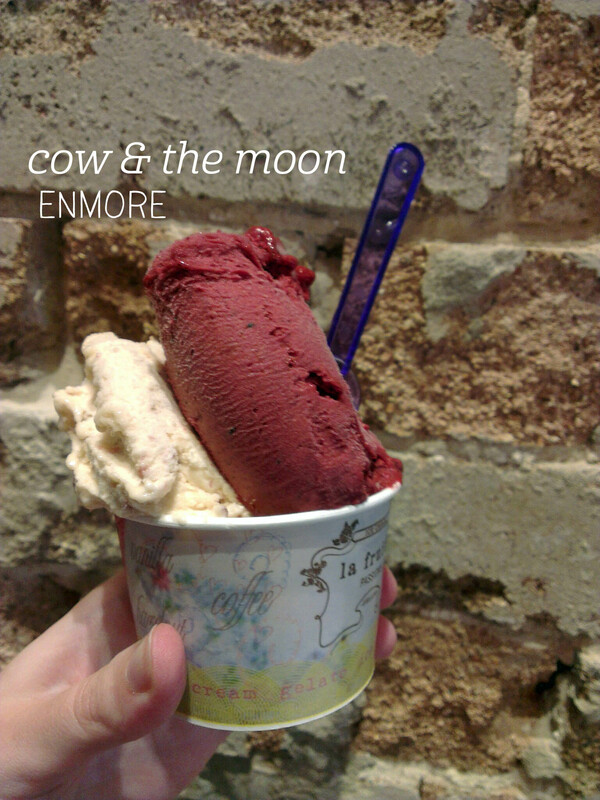 I love Cow & the Moon – it’s pretty much the best gelato I’ve ever had – so I’m always happy to go back and try more of their fabulous flavours. On this visit, I chose two of their fruity sorbets to try, one new and one old favourite. The new flavour was the peach sorbet, which I sampled and fell in love with. 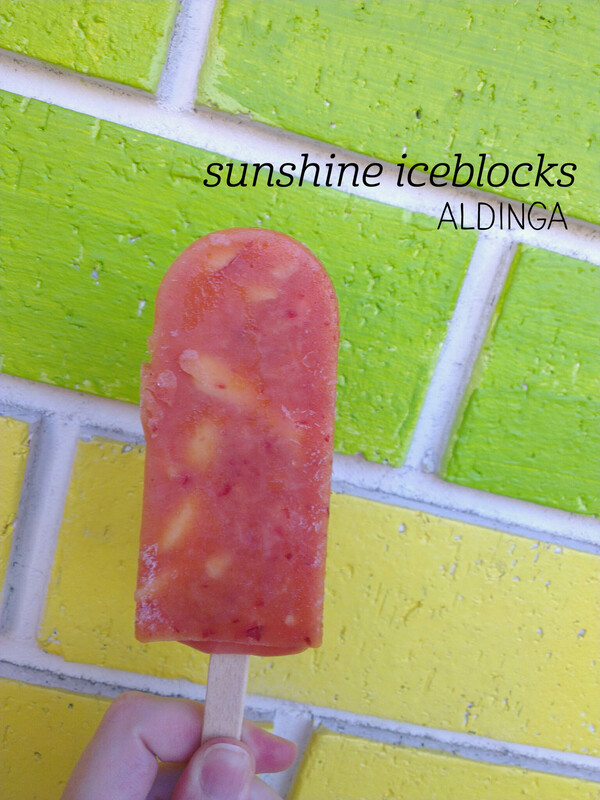 The peach flavour is sweeter than other peach sorbets I’ve tried, so the effect is more like eating a sweet, ripe peach, which I really liked. The texture is perfection – as creamy as any dairy-based icecream – and the flavour is beautifully intense. I also went for an old favourite, the black and blue sorbet, which tastes just like a blackberry chewy lolly. This is the kind of flavour that gets the saliva going, it’s so sweet and tart and bold. Dad ordered the World Gelato Championship-winning Affogato flavour, which I tasted too – oh my. There were caramelised almonds in it, as well as the perfect coffee and vanilla flavours. Swoon. Must visit for anyone heading to Sydney. 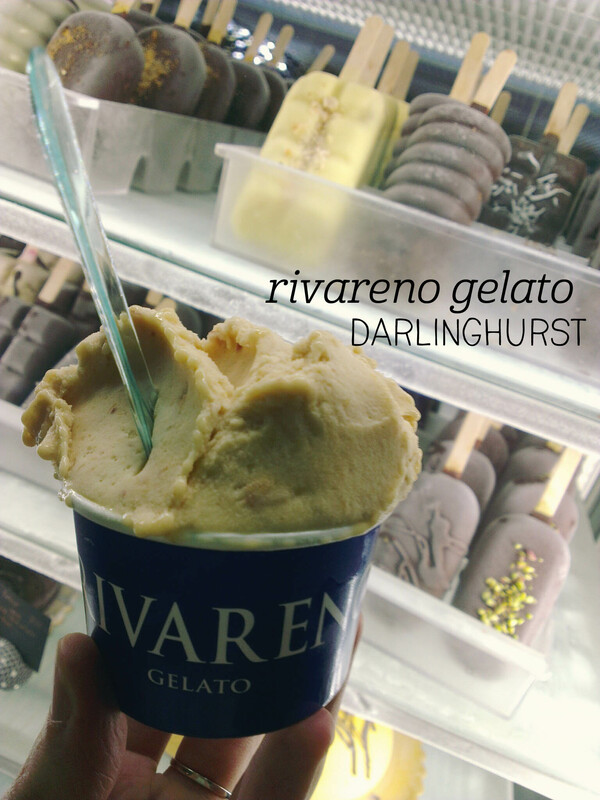 RivaReno Gelato was recommended to me by a friend – they make their gelato fresh daily from scratch, and have a great range of flavours. I was very excited to see a sorbet section on the menu, which included two of my favourite flavours – raspberry and peach. I decided to go for the peach, as it’s the rarer flavour, and was surprised by the creamy texture of the sorbet. Definitely no icy nonsense here, this is the real deal. I was struck by how buttery the flavour tasted, with an almost nutty undertone, meaning that there was clearly no artifical peach flavouring going on. The flavour seemed to develop and become more peachy the more I ate, although it certainly wasn’t a particularly sweet sorbet. I really haven’t had any icecream/sorbet like this before – it was complex and authentic, with flecks of peach skin throughout. I also tasted my friend’s lemon sorbet, which got my saliva going – incredibly tart and acidic, it would be the perfect palate cleanser after a nice meal. The quality here is excellent and I would also be keen to try their chocolate-coated gelato on a stick, which looked amazing in the display cabinet.